~ Yharma ~: Sticks + String = MAGIC! Sticks + String = MAGIC! I want you to take a trip with me in the 'way back' machine. Or maybe even the 'not so long ago' machine. Back to when you first learned how to knit or crochet. Remember how magical it seemed?How thoroughly impressed you were with yourself for using a hook or needles and string to create something? How utterly excited you were to show off your first scarf, socks, or just your first square of stitches? I think that, as we progress in our skills, we sometimes forget about the magic. We're so busy focusing on the next project that we no longer take the time to marvel in the craft. I follow several knitting and crochet groups on Facebook and I absolutely adore it when a new crafter posts photos of their first anything. The excitement coming from their post is almost palpable and every single time it reminds me of my first real project... a pair of socks! I taught myself to knit from a book and am always envious of those who learned from their mother, grandmother, aunt, etc. 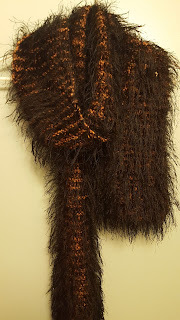 And because I knew no other knitters, at first it was all about the scarves (because all I knew was the knit stitch). And not just any scarves... I knitted scarves out of worsted held together with eyelash yarn! Oh, they were a sight to behold and everyone got a new scarf for Christmas for several years in a row!!! This is the one I gave my husband. Needless to say, he's never worn it. I can't imagine why. Then one day I took a sock class and it truly opened up the whole world of possibilities for me. I remember knitting the cuff and exclaiming to my husband "Look! It really looks like a sock!!!" He was sweet and supportive but I could tell he didn't get it. He had no idea that I was actually performing magic with not only 2 needles, but 5... with points on both ends! I have the first knitting magazine I ever bought, the February 2010 issue of Knit 'n Style. It was actually a wish book as far as I was concerned because there was no way I was ever going to be good enough to knit anything in it. My favorite pattern was the Swing Car Coat on page 55 and I remember thinking that maybe someday I would be good enough to knit that. I eventually moved on and progressed in my skills. Learning fancy stitches like cables and yarn overs. Discovering that being self taught meant that I didn't always interpret the instructions as they were meant and there was a lot to be said for hands-on learning. That's exactly why I'm so awestruck and so appreciative of the spectacular staff of instructors at Harps & Thistles. They are all so knowledgeable about the craft and understand all the nuances of construction, drape and fiber. They teach, encourage and applaud every accomplishment of each and every student... And they remember the magic. To me, there is still something magical in the process. From finding or creating a pattern, choosing the yarn, to creating something from basically a piece of string. If there wasn't, I do not think I would still be trying to recreate that feeling of accomplishment, joy and peace that captivated me from the beginning. I used to try to hurry and rush to get my object finished, but now I relish taking my time and simply enjoy creating in the moment. I am more relaxed and enjoy every single stitch. Each creation contains a piece of me in it, and I enjoy it so much more now than when I tried to hurry through just to finish for the sake of getting it done. I wasn't lucky enough to have a Harps & Thistles, family teacher or friend who could teach me the craft of needle arts. I learned and unlearned the hard way. But that's what makes this craft so magical also...so many wonderful people are willing to give of themselves. Maybe that is where the magic actually comes from. Thanks for sharing your story! I especially love that you love the process and are sharing the magic. We may have both started out alone with a book but we inevitably found our tribe and it's a great one to belong to!